When I first read Candice Fox’s debut novel Hades earlier this year, I couldn’t bring myself to review it. Its themes are so dark, I couldn’t get over the emotional impact it had on me enough to write about it. Dark themes, drawn from a chaotic childhood. Fox grew up as part of a “shared” foster household where encounters with police and visits to prison were routine. As an author, I’ve spent years trying to shut out the late-night knocking, the grisly stories half-heard around the kitchen corner, the screaming and the crying and the wild eyes, by writing myself into safe places, predictable places. But lately, all that darkness has been creeping back in. Rereading the book months later I was able to detach. I knew already the terrain it covered and could concentrate on the author’s skill – in coming up with the plot, in characterising the villains as heroes and the heroes as both victims and perpetrators, and in setting the scene. Hades is a hard book to classify, though its title gives some clue. “Hades” refers to one of the book’s characters, a “fixer” for Sydney’s underworld who takes in two orphaned children, Eden and Eric, and raises them to become police officers – and avengers of their murdered parents. But Hades the Fixer isn’t the central character; the book’s narrator Detective Frank Bennett is. The story switches from third person flashbacks showing Hades and the children, to Frank’s first-person narration, to the points of view of various victims of a serial killer. The hunt for the serial killer provides the chief narrative drive and opportunity for moral questioning of the story. In this context, “Hades” refers more to the place of torment and suffering that many of the book’s characters appear to occupy. The language of morality pervades the book, nudging it from crime into the realms of horror – without ever being supernatural. As Fox has named Stephen King as the person she’d most like to be trapped in a lift with, perhaps this horror element isn’t surprising. As crime-horror, the novel poses a number of ethical and moral questions. What creates a killer – nature or nurture? When is taking another human being’s life justified – if ever? What happens to victims of crime? What moral stance would we take if faced with the prospect of imminent death versus the chance of survival? Does every human being deserve to live, no matter what? With a page-turning plot and enviable style, Fox’s narrative forces the main character – and the reader – to confront these questions. Rereading Hades, I highlighted countless examples of fine writing, way too many to include here. This job is about knowing each other, Frank. It’s about knowing each other’s secrets and ignoring them. We’re all good guys here. No one’s better than anyone else. We’re all dirty. We’ve all got something shadowing us. It’s my hunch Fox thinks this is also true about human nature. Hades is a very interesting read. 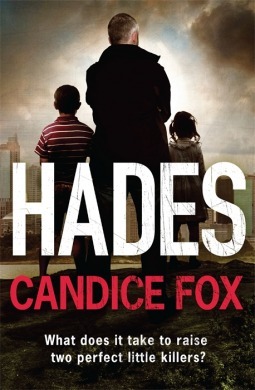 Hades by Candice Fox was published 1st January 2014 by Random House Books Australia (Bantam imprint) ISBN: 9780857981172. Review copy kindly supplied by the publishers via NetGalley. This review forms part of my Australian Women Writers Challenge and Aussie Author Challenge. Sounds like an interesting but challenging read, Elizabeth. It is, Kandy. If I had a hard copy, I’d loan it to you.